Vitamin C is a powerful antioxidant that benefits your body in a multitude of different ways. As a water-based vitamin, the body can’t store vitamin C, so it is important that you get enough on a daily basis. There are certain times that you might want to increase your vitamin C intake – for example, during or after illness as it supports the immune system. 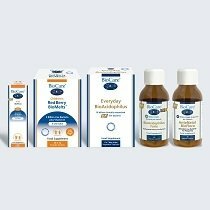 At BioCare, we produce a number of vitamin C products in different forms. Browse our range below or read on for more information about this important nutrient. Vitamin C performs a wide-ranging role in the body, supporting a number of different functions. 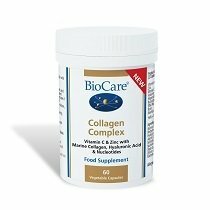 It is an antioxidant, so it helps protect cells from oxidative stress, and it is required both for collagen to work efficiently and for the body to absorb iron. Vitamin C also works hand in hand with magnesium to support the body’s psychological function and metabolism, and to help reduce tiredness and fatigue. 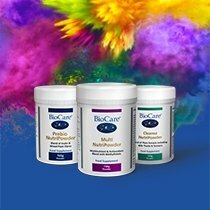 At BioCare, we offer a number of different vitamin C supplements in powder, liquid and tablet form. For all our products, we use a buffered, low-acid form of vitamin C to avoid any potential stomach irritation, and many of our supplements use the magnesium ascorbate form of vitamin C, which gives additional protection to certain minerals in the body like calcium and potassium. Vitamin C 1000 is a low acid, citrus-free magnesium ascorbate in tablet form that also includes the potent antioxidant bilberry – one of the richest sources of natural flavonoids – and grapeseed extract. Vitamin C 500 is a similar supplement with half as much vitamin C included. Vitamin C Powder also provides vitamin C from the citrus-free magnesium ascorbate. We use a unique solvent-free freeze-drying method to protect the purity of this vitamin supplement, ensuring its suitability for individuals with stomach sensitivity or intolerances. We also offer liquid supplement Vitasorb® C, which provides vitamin C in a hypoallergenic purified water base. Our Vitamin C Rosehip Complex powder is a potent mix of antioxidants, providing 1000mg of vitamin C plus rosehip and bilberry in a base of xylitol, apricot, blackberry, and sweet cherry. And our deliciously tasting Mixed Ascorbates provides a similar wealth of antioxidants, plus a number of minerals including potassium, calcium and zinc. Both of these are great to add to water to use throughout the day, or added to a smoothie. Our Immune Intensive product is packaged as a week’s supply in convenient one-a-day sachets and mixes vitamin C with a rich combination of vitamins A and D plus zinc, elderberry and sage – the perfect, all-in-one, handy immune support.